Repairs to Yorkshire and Derbyshire’s old buildings and structures, which have moved or cracked, is something I’ve been involved in for about 25 years. Usually resin bonded or cemetitious stainless steel ties are used. Every building is different though and each has to be treated on merit. Sometimes serious movement has occurred or is starting – I’m usually called in after a Structural Engineer or surveyor has become involved. This is where some knowledge of diamond drilling techniques is needed; you can’t percussion drill a 300 year old wall, held together by soft lime and rubble, without risking some damage. Imagine if we’d turned up at York City walls and started hammering away with a huge rotary drill? We’d probably have be thrown off the job. So where very high performance or safety critical anchors are involved, with soft or particularly loose substrate, a partnership between good appreciation of diamond drilling methods and Cintec grouted sock anchors is essential. Cintec is the trade name of Cintec International. 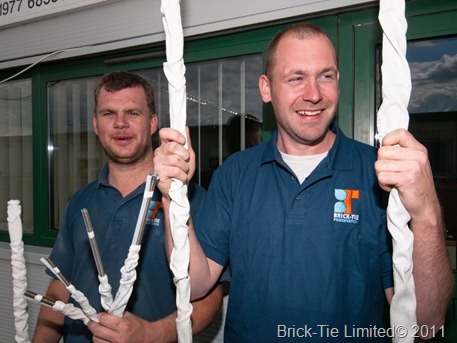 They manufacture their patent socked anchor system from a unit in Newport, Gwent. The anchors are all made to measure for each application, but the design is similar – stainless steel body, surrounded by a woven porous sock, and installed by injection of Prestec cementitious grout; which inflates the sock and fixes the tie or anchor in place. Using grout to fix anchors in masonry is nothing new, most ties and anchors are fixed by either a mechanical bond or a grout, such as resin. Whilst the solution for this is often a resin grout, this too falls down in very thick or rubble filled wall, especially if there are large voids or hollows in the body of the wall. In these cases the resin can be lost in the voids and the tie is left only partially encapsulated, with risk of de-bonding or flexing; where it is unsupported. The Cintec sock takes care of this by retaining the pumped grout, in the oversize pilot hole. Full encapsulation of the tie, be it 300mm, 3000mm or even longer, is always achieved. Very soft hand made bricks in lime mortar, yet a 32mm diameter Cintec tie (8mm body size), easily meets a 5Kn tension test. Typical pilot hole diameters are dictated by a combination of body type (say 12mm threaded body or 20X20mm square hollow section), and the length of the hole. The annular gap around the body needs to spread load and allow the grout to flow back to the open end, from it’s injection point at the remote ‘blind’ end. Hole diameter may be enlarged considerably if the expected stresses are high and the substrate is very soft. When the tie is in place the operator can see only ‘his’ end. During inflation, he’ll eventually see the anchor self-centre, as grout comes through and the anchor inflates. He then knows he has achieved complete encapsulation, along the full length of the tie, with no voids. If there’s an issue, such as insufficient pressure, grout or an obstruction, the near end will not inflate and the operator’s aware there’s a problem to overcome. 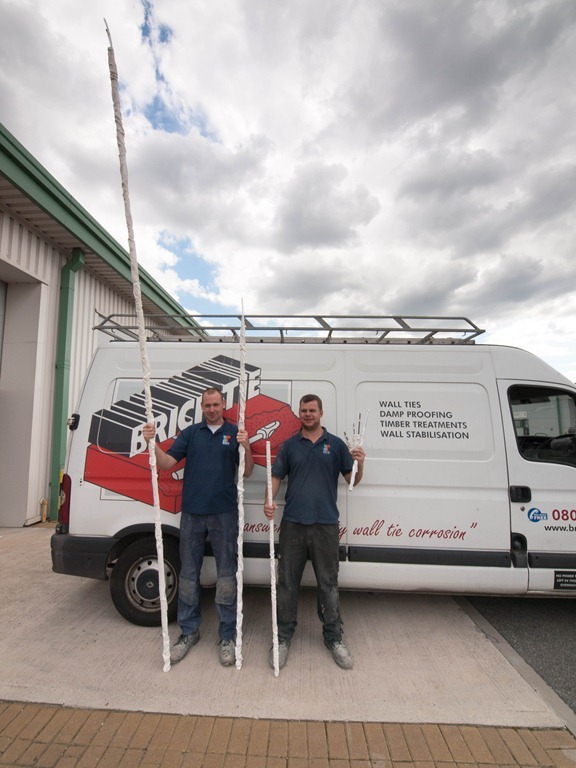 Anyone who has installed resin or grouted ties by traditional means will have come across problems, where operators are guessing, what is happening ‘down the hole’, The longer the hole, the more this happens – this is not an issue with Cintec ties. So are they suitable in all cases? Technically, almost always, but in practice there are reasons for why I also consider other methods too. It’s important to establish a methodology for specifying ties and cost is one thing cannot be ignored, alongside practicality, availability and performance. Cintec ties are bespoke and cost money. The money is well spent where there are issues which only the Cintec anchor can resolve; high performance, hollow walls, soft substrate or rubble fill. Installation in solid walls at relatively short tie lengths wouldn’t normally require investment in Cintec anchors, others may do an adequate job; subject to on site quality control. If the performance can be met and proven, then why not use a more modestly priced system? Well, sometimes a hybrid method may suit a client’s needs. Often jobs end up with a combination of methods in the same building, using say, Cintec for the heavy duty; awkward positions and Helifix CemTies or Helibeam installations, working in partnership with Cintec anchors, to achieve the design aim. This is where practical knowledge of the advantages of varying methods and wide ranging site experience is required. I’ve been involved on many jobs in Leeds, and all over Yorkshire, where only the Cintec system was up to the task and it’s use avoided expensive re-building or even demolition. In the same vain I’ve seen Cintec specified without a full appreciation of the site practicalities and one of my tasks is helping engineers and surveyors choose the correct method; meeting their design brief and being affordable for the client and practical to implement; Every structure is different. Cintec themselves are well aware of the difference poor technique or judgment on-site can make to the quality of the end job. To avoid problems they only sell anchors to their own trained and approved installers. Installers must demonstrate reliability and technicians installing the anchors are assessed on-site, on actual jobs, to make sure that installation methods are correct and maintained. Technicians are graded, depending on the type and size of anchors they’re approved on and they carry a photographic identity card, which remains the property of Cintec International and can be withdrawn in the event of failings in quality control. This is refreshing, as there are many wall tie, lateral restraint and fixing manufacturers, who seem to be little more than stock-shifters and sell ties and basic instruction, with no regard for the consequences of bad workmanship, which could be expensive and even dangerous. I know that my own Leeds guy’s had to get a few years experience under their belts before we started to get the hang of the technology and iron out mistakes.